English astronomer (1646-1719). 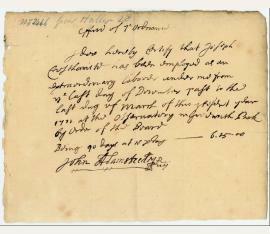 Autograph document signed ("John Flamsteed, MR"). [London. Oblong 8vo. 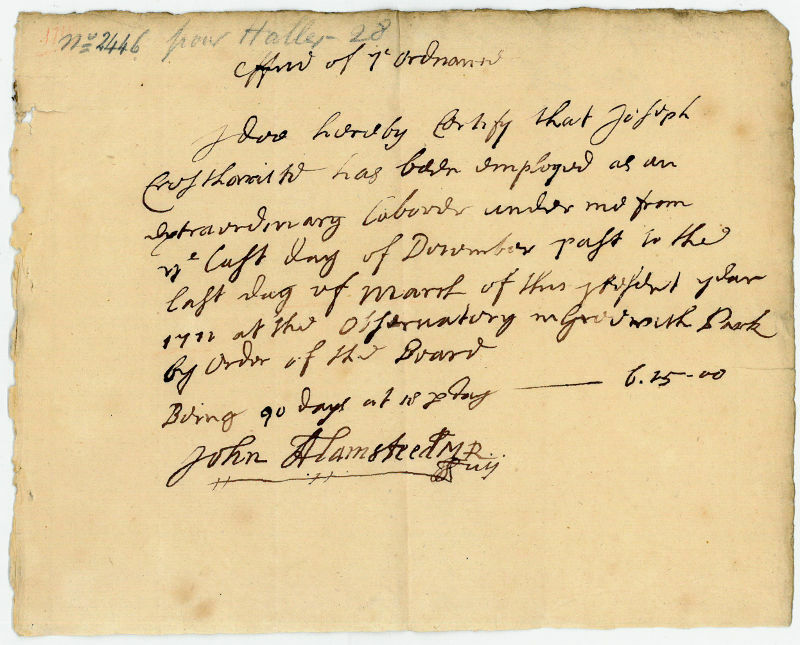 1 p.
Previously unknown payment certificate for his assistant Joseph Crosthwait, written to the Ordnance Office: "I doe hereby certify that Joseph Crosthwaite has been employed as an extraordinary laborer under me from the last day of December past to the last day of March of this present year 1712 at the Observatory in Greenwich Park by Order of the Board. Being 90 days at 18 d a day - 6.15.00". "A number of similar documents, certifying Crosthwait's quarterly pay at various times, survives in different institutions (though they should properly be part of the Public Records)" (Forbes, p.
931, citing a total of seven known specimens in the Library of the British Astronomical Association, London, Staatsbibliothek Berlin, Edinburgh University Library, Historical Society of Pennsylvania, Columbia University Libraries, and at a 1983 Drouot Sale. - Flamsteed, the first Astronomer Royal, catalogued more than 3000 stars, accurately calculated the solar eclipses of 1666 and 1668, and was responsible for several of the earliest recorded sightings of the planet Uranus. Joseph Crosthwait was his longest serving assistant, remaining with the Observatory from 1708 until Flamsteed's death in 1719. At this point, the whole of the first volume of Flamsteed's "Historia Coelestis Britannica" had been printed together with much of the second. Crosthwait saw the second volume through to completion and organised the preparation and printing of the third..